TALLAHASSEE, Fla. (AP) — Days before it came ashore, Hurricane Michael whirled into the Florida governor’s race, and one of the beneficiaries could be Tallahassee Mayor Andrew Gillum, the Democratic nominee who spent days in the storm’s path. While the state waited for Michael to make landfall, Gillum seemed to blanket the national airwaves, sounding much like the man he wants to replace, Republican Gov. Rick Scott, who constantly urged residents to seek shelter and take the massive storm seriously. The system slammed into the Panhandle on Wednesday as the most powerful hurricane to hit the continental U.S. in nearly 50 years. 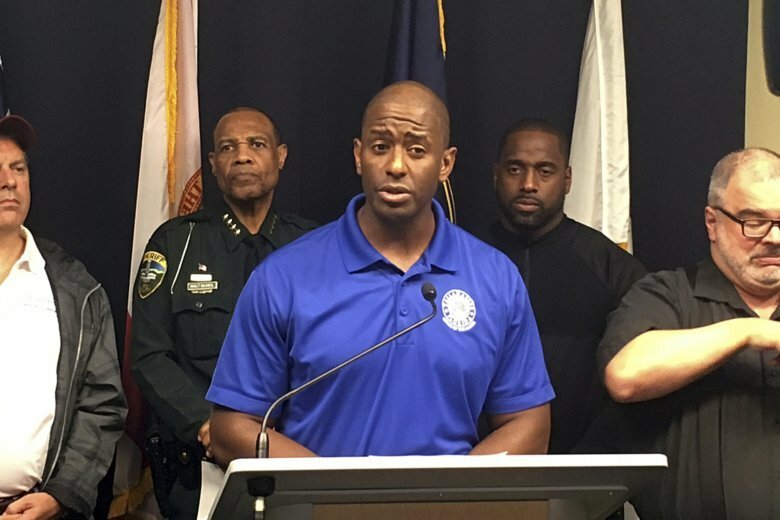 Gillum, who had no direct control over agencies preparing for the storm, made repeat appearances on the Weather Channel and CNN. The broadcasts gave him substantial exposure less than a month before his Nov. 6 showdown against Republican Ron DeSantis. But the appearances also carry risks if the hurricane is particularly damaging. During one interview, Gillum repeated an oft-heard talking point from Scott. “We can put houses back together, but we cannot replace a life,” Gillum said Tuesday on CNN. For his part, Gillum, who is shown by some polls to have a slight lead, downplayed the exposure, pointing out that he was interviewed repeatedly during earlier storms that threatened the region. Former Gov. Jeb Bush was a reassuring presence when eight storms battered the state over a two-year period. Scott has used his past efforts during Hurricane Irma in a campaign ad that has been running ahead of his matchup against Democratic Sen. Bill Nelson. Gillum’s ubiquitous presence on television also threatens to hurt his candidacy if Tallahassee is badly damaged and unable to recover quickly. The tree-lined city is far enough from the coast that it is not endangered by storm surge. But strong winds could easily topple trees, sending them smashing into buildings and homes and causing substantial power outages. While Gillum insisted that the city was ready, he has little direct authority over city government. He is one of five elected officials responsible for hiring the top administrators who oversee the police and fire departments and the city-owned utility. The crisis was seen as a test of leadership for elected officials. Just as Northern politicians are judged on how they handle snowstorms, their Southern counterparts are watched closely for how they deal with hurricanes. Two years ago, Gillum tangled with Scott over power outages that plunged most of Tallahassee into the dark following Hurricane Hermine. City officials came under fire because the city turned down help from at least one outside utility company. That criticism has now turned up in ads being paid for by the state Republican Party that target Gillum. Gillum has said the ads are false, and his campaign asked for them to be taken down. But since Hermine, Tallahassee has adopted mutual-aid agreements with private utilities and arranged for hundreds of utility workers to respond to Michael. “That is a substantial ramp-up,” Gillum said. The storm has proven a substantial challenge for DeSantis. In light of the hurricane, his campaign turned planned campaign events into a relief drive. Jeannette Nunez, a Miami legislator who is running with DeSantis as lieutenant governor, spent time earlier in the week at the state emergency operations center. Nunez this past year oversaw a legislative committee tasked with looking at how the state fared under Hurricane Irma. “We are not worried about the campaign,” Nunez said. Gillum said he will remain focused on the storm “until we get back up and frankly get the power restored.” He said that could mean skipping campaigning for a while in South Florida, where the bulk of the state’s Democrats live. And that may prove pivotal because it’s not clear if voters in that region are paying as much attention to the storm as those in northern Florida. Fort Lauderdale residents Grace Appleton and Eric Held said they had not seen Gillum’s appearances related to the hurricane. Both had seen the attack ads. Appleton said she saw the commercial alleging Gillum failed to help Tallahassee residents with a power problem but said she wasn’t necessarily swayed by it. “I’ll Google it to make sure what the facts are,” said the 59-year-old real estate agent. Associated Press Writer Kelli Kennedy contributed to this story from Fort Lauderdale.